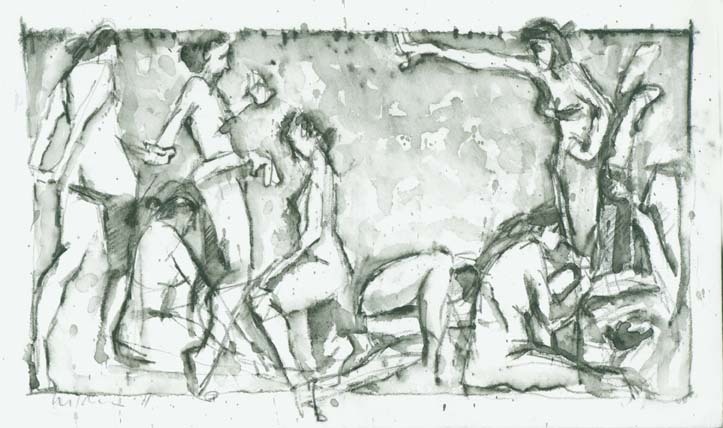 I did this small drawing (6×10) yesterday from fast poses, about one to three minutes. 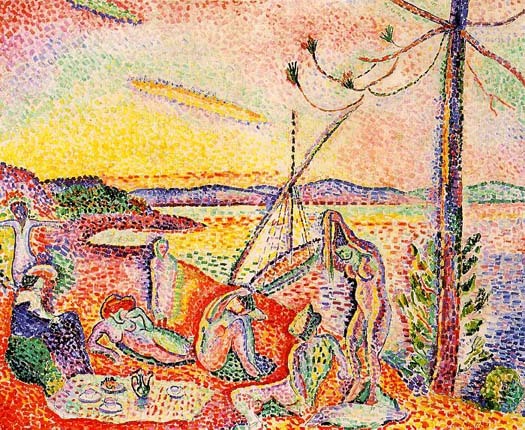 Now, a day later, it reminds me of Matisse’s painting, “Luxe, Calme et Volupté,” 1905. Not in technique, but in the sense of pleasure that it conveys. In the Matisse painting, as in my drawing, the nudes are at ease and are loosely sketched, without much fuss about anatomy. I’ll speak for myself and the materials I used. This drawing is done on mat board, specifically 4-ply museum grade mat board. Now, mat board is not intended to be drawn on; it lacks fiber and sizing. I think of it as compressed lint. But, oh, it is luxurious to draw on, if you give it a thin coat of clear acrylic gel. This seals the natural ragediness of the mat board, making it friendlier to the friction of the pencil. The pencil I used here is the Stabilo-Aquarellable (see post 4.19.11) which loves the mat boards cushy surface. It sinks in at the slightest pressure, produces a rich velvety line and deposits lots of black stuff for later washes. When I’m preaching the importance of pleasure in drawing I’m perhaps a bit reactionary, in the sense that our contemporary art tends to the conceptual, the constructed, the engineered, the ironic, the alienated. That’s fine, I love having my brain tickled. But the artist’s rapport with the materials themselves has been suppressed, possibly even lost. You can be sure that the original modernists, like Picasso and Matisse, loved their paints and their charcoal, their brushes and papers, their glops of paint and their drips. They loved the mess and the physicality.